For author Tina Welling, it’s where household chores fade from mind and fictional characters come to life. In graphic designer Katherine Tomkinson’s case, it’s a place to create posters, web pages, books, and more as her two little boys play nearby. And for Ashley Wilkerson Moore, it’s a nighttime retreat where she can edit her photos while her eighteen-month-old toddler slumbers upstairs. 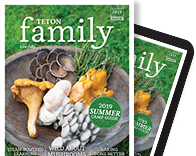 “It” is the home office, a species of interior design that comes in infinite configurations and sizes—though for real estate reasons, the Teton variety is often small. No matter the dimensions, home-based businesspeople and creative types find a way to make their spaces work. 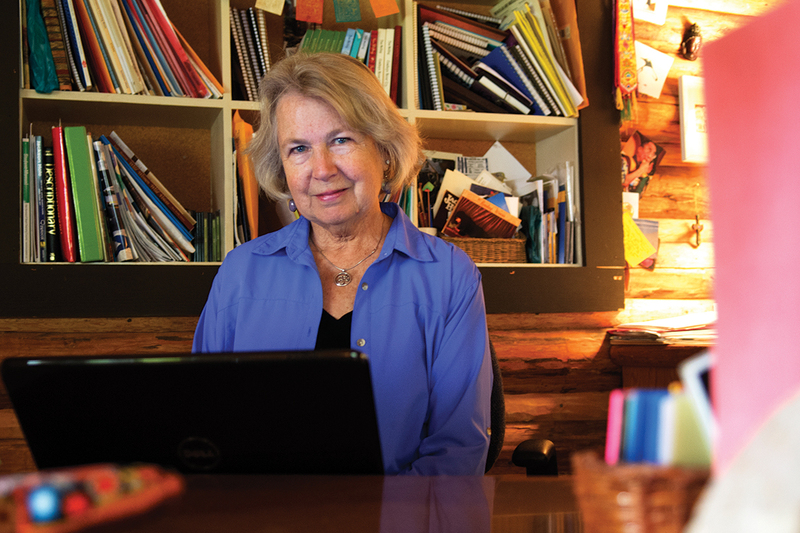 “It’s a room I can find refuge in as well as be productive,” Welling says of her office area. “It’s a good room for daydreaming.” Welling’s room is actually outside of the home she shares with her husband, John Buhler, in Hidden Ranch. In what was once the ticket office for the National Elk Refuge sleigh rides, she has completed three novels, a writing book, and is now deep into a young adult environmental mystery. “It came with a woodstove and some cowboy counters, and I pretty much left everything as is,” Welling explains. 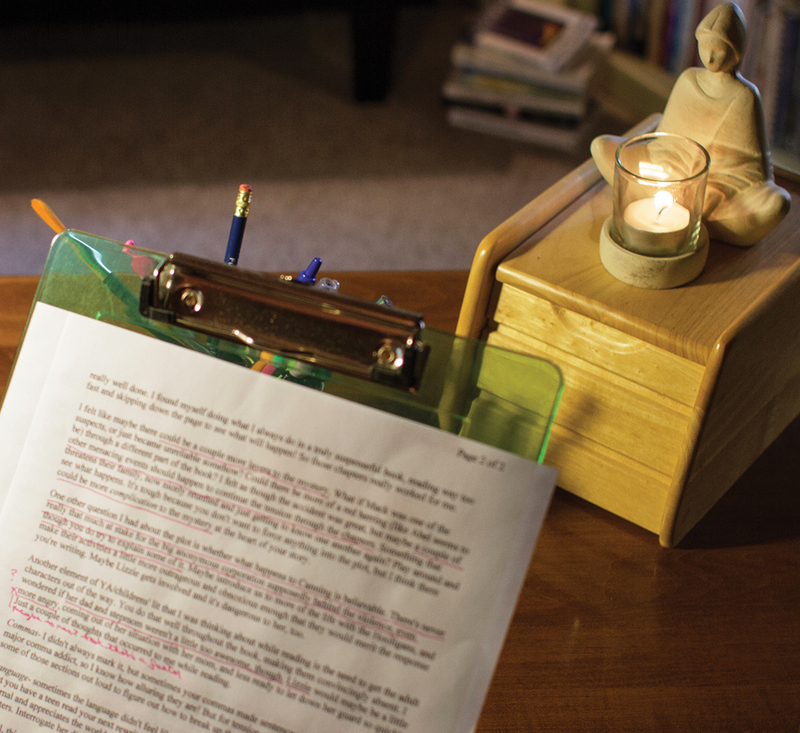 What she did add was a good-size desk that belonged to her father, a futon, lots of Buddhas “to invite calmness,” and rocks, bones, and other natural objects she finds inspiring. Welling also has her toys, from snowshoes and cross-country skis to a fly rod and knitting supplies. “Surround yourself with things that remind you of your best self,” is her suggestion for people who make their living at home. It all works perfectly. Welling can lay pages on the counters and “see how they’re feeling when all spread out.” She can stretch out on the futon or gaze out one of the three windows. Perhaps best of all is that she doesn’t have to worry about dusting and tidying. “It’s a room that I never feel like I have to organize or clean or make ready for company,” Welling says. Fortunately, Parker, who is four and a half, and Chase, three, understand that business is business. 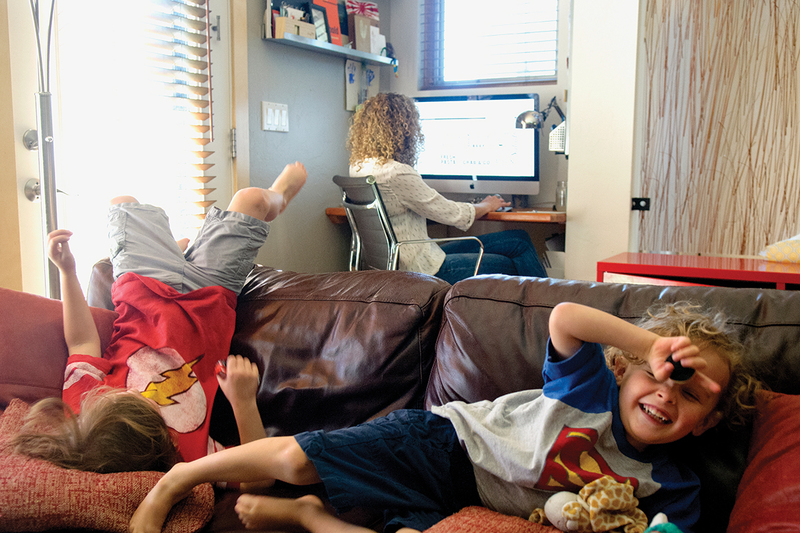 “The boys know that mommy’s workspace is off-limits,” Tomkinson says. So although there is a cabinet of toys directly next to her desk, she claims her boys are generally pretty respectful of her space. Moore works in the guest bedroom in the basement of the townhome where she lives with her husband, Trent, and their son, Jackson. It’s far from enticing—she jokingly calls the space her “dungeon”—but it does the job. Moore has a large desk that nicely accommodates an iMac, a Canon printer, more than a dozen hard drives, and “a big cup of coffee.” The guest bed is nifty, with a storage area under the mattress where she can stash lighting equipment, camera gear, and backdrops. Between weddings, family portraits, kid portraits, and business shoots, Moore works with about forty thousand images a year and spends forty to fifty hours a week at her desk. She hasn’t childproofed the office for the mere fact that when she’s with Jackson she wants that time to be all about him. So that means she gets to her desk at night. Brothers Parker, four and a half, and Chase, three, romp on the sofa while mother Katherine Tomkinson works in their Jackson home. 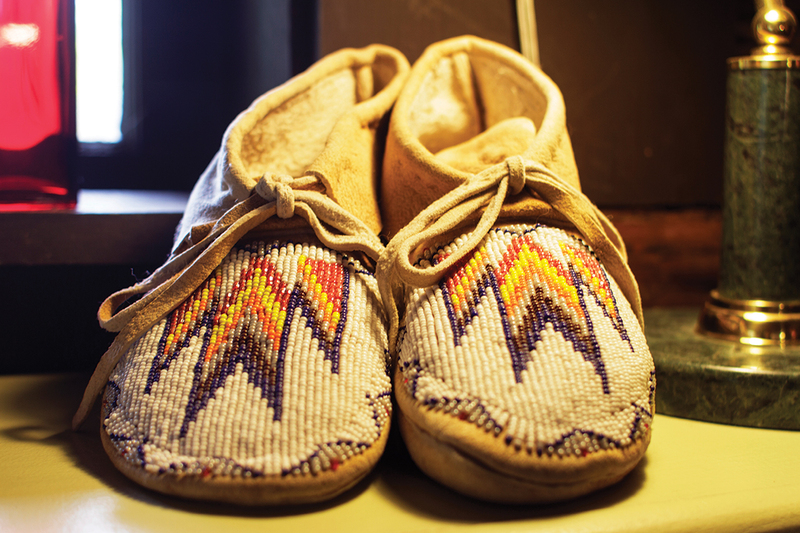 Novelist Tina Welling surrounds herself with inspiring objects at her homeside office, which was the ticket office for the National Elk Refuge sleigh rides.